Applications: Although optimised for stainless and hard steels, these discs will also give a faster cut and produce less waste on mild steel. Sizes are available to suit almost all angle grinders from 100mm to 230mm. The 75mm discs have 9.6mm bore and are suitable for air tools with an appropriate mandrel. The 355mm discs fit most standard chop and bench saws. Product Notes: These discs comply with EN12413. They are free from sulphorous, ferrous and chlorinated fillers and can be used on stainless steel without contamination risk. 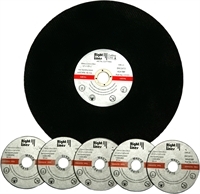 The 75mm discs are rated for 25,000rpm to suit air-tool speeds. Also Available: For working on stainless steel, we offer a range of stainless steel grade grinding discs. We stock a mandrel suitable for our 75mm slitting discs.